The Everglades Wonder Garden has been a landmark in Bonita Springs since the 1930's, operated by the Piper Family. The Wonder Gardens basically features Florida Fauna displayed in a green jungle of tropical growth like banyan trees and bamboo. The attraction has survived when most similar enterprises have long disappeared. On another note, I can recall visiting another animal attraction in New Port Richy in the 1960's as a kid with my family. The place was actually the sight of an animal import business which opened up its property for the tourists to tour. As I recall the place had large cages crammed with monkeys from South America. I remember that they also a South American Anteater on a tether and an Amazon Dolphin in a small concrete pool. To a small kid it was kinda cool, but today these places could not operate like this today. Arrived at The Celery Fields in Sarasota about 10 o'clock where I met John Whitehead. John put me onto several birds including a juvenile Purple Gallinule. Arrived too late for the sandhill cranes and the other waders weren't too numerous. We did have at least eight Limpkins, a Great Blue Heron, a couple each of Great Egrets, Snowy Egrets, Little Blue Herons and Tricolored Herons. Did not have any white ibis at the time, but there were six Glossy Ibis and six more Cattle Egrets on the grassy berm with Common and Boat-tailed Grackles, Red-winged Blackbirds, Palm Warblers a small flock of newly arriving Savannah Sparrows. I was interested in shore birds and had a pair of Lesser Yellowlegs fly in as did a flock of a dozen or so Dowitchers. We also had Western and Least Sandpipers plus a trio of Killdeer and a Wilson's Snipe. Noted a Mallard x Mottled Duck hybrid fly in plus a few Blue-winged Teal and Mottled Ducks were present. John had seen a couple of black-bellied whistling ducks, but I dipped on them. Other birds seen included Wood Stork, Common Coot, Common Gallinule, a Caspian Tern, a Kestrel, a pair of Osprey, a Bald Eagle and eight Anhingas. Next stopped at Cockroach Bay Road near Ruskin. A Northern Harrier was patrolling the waste water mitigation ponds. Had all the same waders as at The Celery Fields, but I could add a single Roseate Spoonbill. The shore birds were limited to a Greater Yellowlegs, two Lesser Yellowlegs and a Killdeer. Osprey are very common here and I counted six American Kestrels on the wires. The rafts of American Coots are back and had a count of over a hundred birds. Had a dozen Blue-winged Teal which were keeping the company of a lone female Redhead. Other sightings include Common Gallinule, Tree Swallows, a Loggerhead Shrike, a House Wren and Pied-billed Grebes. Lastly stopped at Ft Desoto Park in Tampa Bay. Had a few Redheads at the Terra Verde ponds along with a huge number of Double-crested Cormorants. A check for any migrants lingering in the park produced very little. I was interested in finding the reported ash-throated flycatcher and any snow plovers. dipped on both. Did find a couple of Red Knots and ten American Oystercatchers. Other shorebirds included Willets, Ruddy Turnstones, Sanderlings, a Dunlin, a Piping Plover, Semipalmated Plover, Black-bellied Plover and Least Sandpipers. Other birds of the shore included Laughing Gulls, Royal Terns, Forster's Terns, Sandwich Terns, Ospreys, Magnificent Frigatebirds and Black Skimmers. Birds of the woods included a couple of American Redstarts, a dozen Palm Warblers, a lone Pine Warbler, a pair of Eastern Phoebe, House Wren, Blue-gray Gnatcatcher, Mockingbirds, Catbirds and Starlings. My purpose for this day's trip was to try to reach a goal of 160 birds for the month which I did accomplish. After spending so much time lately chasing the fall migration I took some time to visit a couple of my favorite spots. Spent the mourning visiting Babcock-Webb Wildlife Management Area in Charlotte County. Started with locating a pair of Red-cockaded Woodpeckers. The most common birds were Common Grackles followed by White Ibis, Pied-billed Grebes, Eastern Meadowlarks, Belted Kingfishers and Pine Warblers. Other warblers included a lot of Palm Warblers, a few Common Yellowthroats and a sole Prairie Warbler. Was able to add a FOS Wilson's Snipe, a Bald Eagle, Common Ground Doves, an Eastern Phoebe, Loggerhead Shrike, a Yellow-throated Vireo, a single Eastern Bluebird , at least four Eastern Towhees, several chattering House Wrens. Found several Northern Mockingbirds, a couple of Brown Thrashers, plus several Northern Cardinals. While making a final stab at locating any nuthatches or bobwhites, which I dipped on, I was surprised to find a Broad-winged Hawk and then a Sharp-shinned Hawk flew past my car. Both hawks are migrants. Some of the them may stay for the winter, but mostly they are heading south. Later in the day I headed over to Harn's Marsh in Lee County. The water level was still high so waders were not very numerous. Did get Great Blue Herons, a couple of Limpkins, Great Egrets, Snowy Egrets, Tricolored Herons, a single Glossy Ibis, a dozen Cattle Egrets and no white ibis. American Coots have arrived and had a couple of Common Gallinule, another Wilson's Snipe, a trio of Least Sandpipers and a single Killdeer. The usual Turkey and Black Vultures are present and did find only two Snail Kites today. But the migrant hawks were present here too, including another Broad-winged Hawk, a Merlin, a Kestrel and a Sharp-shinned Hawk. Had a couple of Savannah Sparrows in the company of a couple of Palm Warblers and a flock of Tree Swallows passed over just as I was leaving. As for ducks I counted twenty Mottled Ducks and a trio of Blue-winged Teal. Won't be long and the variety of ducks will be increasing soon. Today we had the hawk watch at the Sanibel Lighthouse, sponsored by Audubon of SW Florida. It kicked-off at 8 am on a brisk, clear morning, with Vince McGrath as leader of our group of about fourteen birders. Right off the bat, Gayle Schmidt reporting sighting a Scissor-tailed Flycatcher and as we moved up the path we come up with our FOS Yellow-rumped Warbler. But it wasn't a Myrtle race, it was a rare to south Florida Audubon's Warbler. So we started out with two western birds uncommon in Lee County. Then we found the recently reported male Pin-tailed Whydah. No doubt an escapee, but it did put on a good show. Over the course of four hours we did not get big numbers of hawks, but did have a good variety - a couple of Kestrels, three Merlins, a pair of Sharp-shinned Hawks, a juvenile Red-tailed Hawk, two Northern Harriers, a Broad-winged Hawk and at least three Osprey. As for our non-raptor finds we had Baltimore Oriole, Scarlet tanager, Blue-gray Gnatcatchers, Yellow-throated Vireo, White-eyed Vireo, Tennessee Warblers, Blue-throated Blue Warbler, lots of Palm Warblers, a Prairie warbler, a late Cerulean Warbler, American Redstarts, Bay-breasted Warblers, Indigo Bunting , a female Painted Bunting, several Chimney Swifts and a sole Northern Rough-winged Swallow. Following the hawk watch, I headed over to Ding Darling National Wildlife Refuge for a quick drive trough. Was able to see a large number of American White Pelicans, Roseate Spoonbills, Snowy Egrets, Great Egrets, Willets, Short-billed Dowitchers, Pied-billed Grebes, a hand-full of Black-bellied Plovers, Least Sandpipers and Western Sandpipers. A good day to bird on Sanibel. Returned to Six-Mile Cypress Preserve for day two of an outstanding fall migration experience. Could not get there till ten o'clock, but stayed for eight hours. It was also a great diagnostic classroom with species we do not host very often. Such as the many bay-breasted and chestnut-sided warblers we were present. Met Robert Repenning in the parking lot were we exchange updates and joined up with Jose Padilla, Stan Damen, Walt Winton and Gail Campbell on the boardwalk. One observation that was noted was that we were seeing a different mix of birds today then yesterday. It was believed that last night's cold front had moved on much of what we saw yesterday and brought in a fresh batch. The variety of thrushes had thinned out to finding only Swainson's Thrushes. The high numbers of Black-throated Blue Warblers had also diminished to a lone female specimen. American Redstarts and Blue-gray Gnatcatchers still remained the most common. We still had Carolina Wrens, Gray Catbirds, an Ovenbird, a couple of Northern Waterthrushes and lots of Black-and-White Warblers. Also had many Bay-breasted, Magnolia, Chestnut-sided, Blackburnian and Black-throated Green Warblers. We later ran into Gayle Schmidt who confirmed many of our finds such as a Blue-winged Warbler and a couple of Hooded Warblers. We also found Palm Warblers, Pine Warblers, a Prairie Warbler, a couple of Scarlet Tanagers and several Rose-breasted Grosbeaks. Other birds seen included a Belted Kingfisher, Downy Woodpeckers and a Hairy Woodpecker. A Blue-headed Vireo was a first of the season for me. It was a good day!! Another birder we met was Ruth Woodall who was hosting some out of town guests and having a good time. They reported that on their visit to Bunche Beach earlier, they had located several Avocets. I seriously considered heading there, but there was just not enough time left. Later..
Today weather conditions were continuing to be a big boost in our bird counts and variety, as storms were holding back the migrants. So Back to Six-Mile Cypress Preserve. Arrived a bit after 9 AM and ran into Bob Repenning who works here just as he was coming in from his own bird count. He was reporting Verry, Swainson's and Hermit Thrushes, Grosbeaks and other migrants. In fact he helped me with quick finds on Swainson's Thrush, Gray Catbird, American Redstart and Chestnut-sided Warbler. Proceeding on, I added Scarlet Tanager, several Bay-breasted Warblers (LIFER), a Hermit Thrush, Blue-gray Gnatcatchers, Magnolia Warblers, Rose-breasted Grosbeaks, Pine Warblers, a Prairie Warbler, Northern Waterthrush, Tufted Titmice, Red-bellied Woodpecker, Downy Woodpecker, Tennessee Warbler, more American Redstarts, a female Blackburnian, several Black-throated Blue Warblers, Common Yellowthroat, Black-and-White Warblers, a couple of Palm Warblers and a couple of Yellow-throated Warblers. By now I had meet up with Stan Damen, who had already put some time in looking for the migrants. He had already seen most all of the above plus an FOS Yellow-bellied Sapsucker and a Summer Tanager. We continued on and was able to re-find the Summer Tanager. Later Jose Padilla rejoined us on his lunch break. He had also birded here earlier today before work and just had to come back. I bet he stopped back after work too. Well the three of were able to add another thrush to the list, as we watched a pair of thrushes actively interact with each other in some Dahoon Holly bushes. When comparing the birds we realised that the smaller of the two was not a Swainson's, but a Gray-cheeked Thrush (LIFER). A white-morphed Short-tailed Hawk was spotted over head, a Barred Owl could be heard and an Ovenbird greeted us as we exited . With a cold-front coming in tonight, I expect to return tomorrow. From here I was suppose to meet-up with Bob Pelkey at Sanibel Lighthouse. But I took too long and missed Bob. I did stayed for a couple of hours and with strong winds the birding was tough. A trio of Indigo Buntings was keeping company with an Eastern Wood-Pewee and an Eastern Phoebe. Also had a dozen or so Chimney Swifts actively feeding over the lighthouse in the company of some Northern Rough-winged Swallows and a House Wren. With the fall migration in full swing and severe weather blocking their egress out of Florida, there is the promise for good birding today. Headed out to Six-mile Cypress, were I was expecting to run into other like-minded birders. Arrived about 9 am and almost immediately had hits on Gray Catbird, Northern Cardinal, Yellow-throated Vireo, Black-and-White Warbler, Eastern Wood-Pewee, Prairie Warbler, Pine Warbler, Blue-Gray Gnatcatchers and a marsh hare. Turned out that Jose Padilla was right behind me working on the same mixed flock. He already had an Ovenbird, White-eyed Vireo and had photographed the Wood-Pewee. We both got great looks of a feeding Red-eyed Vireo in the same tree with the yellow-throated vireo. The birding continued to go well with locating a pair of Rose-breasted Grosbeaks near the Pop Ash Pond, plus American Redstarts (most numerous bird of the day), Great Crested Flycatcher, Tufted Titmice, Downy Woodpecker, Red-bellied Woodpeckers, more Black-and-White Warblers. Continuing on we added Magnolia Warbler, Eastern Phoebe, and then had an Acadian Flycatcher. Jose contacted Vince McGrath, who was birding with Walt Winton and Stan Damen at the Sanibel Lighthouse, about the acadian and grosbeaks. They had hits on Chestnut-sided Warbler, and both Indigo and Painted Buntings. Vince also had a hit on a Mississippi Kite and a flock of hundreds of Chimney Swifts passing over Sanibel yesterday, while doing a hawk watch. Well they hurried over to look for the acadian. The trio arrived rather quickly and the hunt was on. But the flycatcher was not to be re-found. However we continued locating warblers including Northern Waterthrush, Ovenbird, Palm, Tennessee, more Magnolias, Common Yellowthroat and Northern Parula Warblers. We were about to wrap things up when a another pair of birders told us about seeing at least a pair of yellow-billed cuckoos and a bright red male summer tanager. So it once more around the boardwalk. Of course we missed the summer tanager and the cuckoos, but we did end the day with a Scarlet Tanager. Also can add Chimney Swift, American Kestrel, Wood Stork, Red-shouldered Hawk, Anhinga, Hairy Woodpecker, Blue Jays and White Ibis. So we got some good migrants today and this weather could be around for a couple more days. I would also add that I had birded Six-mile Cypress almost daily since the end of September with occasional visits to Sanibel Lighthouse and Caloosahatchee Creeks Preserve. Some of the migrants I had been successful with month included Verry, Swainson's Thrush, Short-tailed Hawk, Black-throated Green Warbler, Summer Tanager, Canada Warbler, Merlin, Peregrine Falcon, Northern Harrier and Sharp-shinned Hawk. So far the fall migration has been much better for us then the past spring migration. Saturday I wanted to squeeze in some birding in the morning before going into work. First checked out my patch along Domestic and Lee Streets in San Carlos Park to see if the burrowing owl are present. Seems that following the fledgling of the chicks the two families of owls that I have been watching have moved to new digs elsewhere. As of this visit none are found. Did have some Palm Warblers and a FOS American Kestrel, plus a few Mourning Doves, a couple of Loggerhead Shrikes including one with a dragonfly skewered on some barbed wire, some singing Eastern Meadowlarks and a juvie Red-shouldered Hawk. Next onto Six-Mile Cypress Slough Preserve to look for migrants. Bird-wise things were actually slow. Ran into Stan Daman who had already done some birding, finding a couple of warblers. As we were speaking we came up with a male American Redstart and a Northern Parula, plus Blue-gray Gnatcatchers, singing Carolina Wrens and Tufted Titmice. Later we ran into Jose Padilla at the far side of the boardwalk. Still the birding was slow, but as we were talking a couple of warblers did show up. 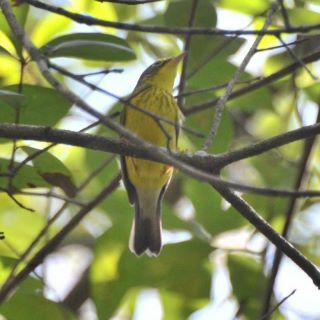 The first was a Black-and-White Warbler and then to our surprise we were able to id the second bird as a female Canada Warbler, The canada is not very common at all in Florida during migration as they generally travel down through Texas. So it was a welcome addition to my Life list As we were leaving we were to locate an Ovenbird near the pavilion.